Love is in the air again…and this time it’s steamy, bold and manipulative! Gayatri, a rich, spoiled diva, is fighting to establish herself even as her tyrant father pushes her into a life not of her choice. Viraj is a genius and a con who shuns society and its hypocrisies. Gayatri sees Viraj only as a means to an end. For Viraj, Gayatri is the epitome of all that he despises. So when their paths cross, it is a battle of feisty wills and desire. Will Gayatri and Viraj prove to be each other’s salvation or annihilation? From the best-selling author of Right Fit Wrong Shoe and Wrong Means Right End comes Rightfully Wrong Wrongfully Right. All the unforgettable characters of the earlier two bestsellers make a comeback in this unforgettable story of hurt, hearts and hope. This is a tumultuous journey of two Wrongs who might just make everything Right! Varsha Dixit, the best selling author of four successful contemporary romance books. 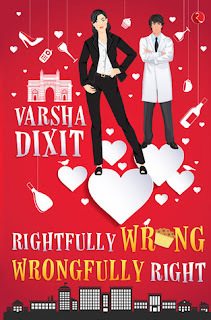 Her debut book, Right Fit Wrong Shoe was a national bestseller for the year 2010. Varsha was a part of the Indian Television Industry and worked as an assistant director and online editor. She considers herself a dreamer who thinks deep but writes light. Even though creativity is gender free,Varsha feels blessed and enriched to be a woman.Currently, with her family, Varsha resides in CA, USA. With a bright and youthful cover like this , who can miss noticing this book which promises to a perfect roller coaster ride for every reader? The first thing that caught my attention is the profession of the hero. Never in my wildest dreams had I imagined that a scientist could be playing the main lead in a rom-com. The author has not only done justice to his depiction but also left me smiling with their crackling chemistry.The character sketches of both the lead characters is unique, just like their love story . What begins a comedy of errors leads to a perfect love story that ends into a happily ever after but is it so easy as it sounds? Of course not, what is love if found so easily! The characters go through their own turmoil, both internal and external before finally ending up together. The dialogues and the banter between them is entertaining and does make you laugh at a lot of places. The language is lucid and the narrative very fluid when it comes to descriptions. It is a light read that promises to leave you with a feel-good-feeling. Though there are a few things that don't fit the bill - like why is the hero a scientist? As his career has no role to play in the story. He could have been anything else and the story would have been as perfect as it is. Secondly somewhere just before the climax it is all revealed to the readers that both of them are in love with each other then instead of focusing on their reasons to stay apart or their emotions the story moves onto 2 secondary characters who in some places do tend to get a bit too much. Gayatri is shown as a bundle of conflicts, a very normal thing which I could connect to largely. Viraj has his own insecurities to deal with and ghosts from the past haunt them both. Yet their love triumphs and how! That's beautifully captured in this story and the author deserves full marks for adding perfect dose of charm, romance (full with love making scenes) , emotions and logic to make it a balanced read. Recommended for readers who enjoy romance and light reads. 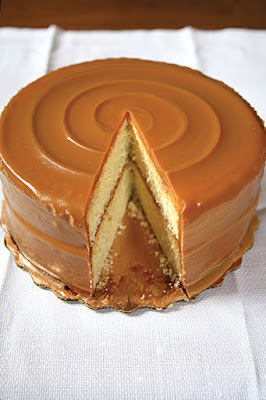 This book is like caramel cake - soft, delicious and melts in mouth!